Occupy Wall Street: What can the protesters achieve? The singer keeping the Occupy Wall Street protesters entertained in Liberty Plaza in New York sounds uncannily like the young Bob Dylan. "In unrestricted greed we trust, bail out the banks and not the single mum, borrow from China to pay for the bombs…"
The protest song may be coming back into fashion. An American flag flies in the square, but there's a difference. This one has the stars replaced by corporate logos. It just about sums up what this movement is about. America, they say, is ruled by a few rich companies. "Democracy has never been a spectator sport and Americans have an obligation, particularly if we claim to love our country, to build serious and meaningful change from the bottom up." There are many on the left who hope this is their version of the Tea Party, which has had such a huge impact on American politics. 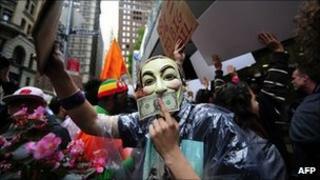 The Occupy Wall Street FAQ denies the comparison, saying they are not about "disrespect, mistrust and marginalisation". Of course, their aims are completely different. They are made up of different types of people, divided by age and wealth more than anything else. The Tea Party dislikes big government, not big corporations. But both movements feel a deep frustration and a distrust of the elite who make the rules. There is a common feeling that the system is unresponsive to the needs and wishes of the people. A suspicion that the system itself is broken. I strongly suspect that many Americans who wouldn't sign up to the ideology of either the Tea Party or Occupy Wall Street share this feeling of malaise. These are early days, but Occupy doesn't seem to have drawn people into politics for the first time in the way that the Tea Party has. There is another critical difference too. The Tea Party worked as a very effective galvanising force within the Republican party. They were disillusioned conservatives who forced their natural party onto a more economically conservative route. They did this not by floating ideas in the ether but by deselecting candidates they didn't like. They are having a huge impact on the Republican presidential selection process at the moment because they are the most active, most vocal part of the Republican electorate. While many Occupy supporters will have worked to elect Obama, many are now disillusioned. Their way of getting involved again is not to influence one party in the mainstream political process, but to urge radical reform of the process itself. That is a lot more difficult to achieve.